(WBIR - Maryville) Cats are known to have the so-called insurance policy of nine lives. Four-legged Charlie of Maryville used one or two in his supply before the Christmas holiday. However, Charlie is a two-year-old Chihuahua mix. "He might be part-cat," owner Nancy Huskey said. "Might have nine lives." The timid canine sits on Huskey's lap, days after a scary incident involving the elevator at his owner's apartment at the Broadway Towers in Maryville. "I got on the elevator, and the door shut, and Charlie wasn't with me," Huskey recalled. As caught on surveillance camera Dec. 19, Huskey walked inside the apartment garage's lift, thinking Charlie was with her inside. The doors then shut, with Nancy holding Charlie's leash. But the dog was on the other side of the doors. "I heard him yelp," Huskey said. 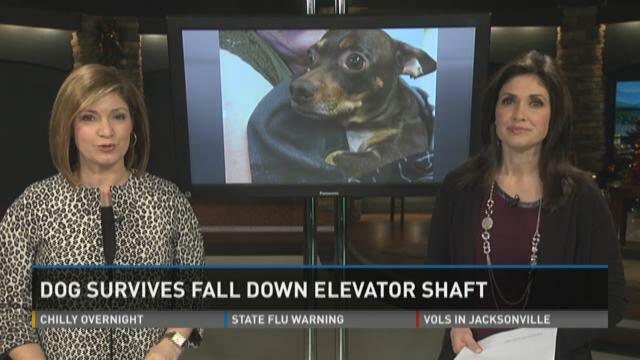 The elevator lifted the dog in the air, attached to the corner of the elevator's doors. 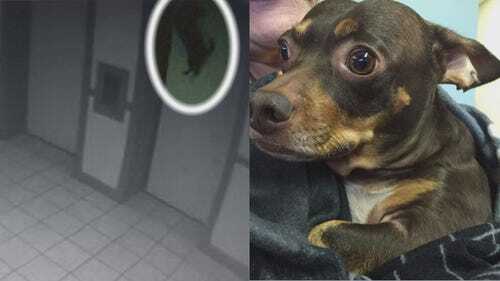 A resident attempted to free the choking canine, but as soon as the metal doors opened, the dog fell approximately 30 feet down the elevator shaft to the landing. "That's when he must have yelped, when his collar came off," she added. Maintenance crews were called to free the pup, stuck in the dark hole. Cameras caught Huskey and her family visibly upset, wondering if the dog was still alive. "Prayed the hardest I've prayed in my life. It's like losing a child," she said. An hour after the fall, technician Leon Manuel got Charlie out from the shaft, and despite the fall, he suffered few injuries. "You ain't going through what you're going through again..." she said to her friend. Technicians said that since the incident, the Maryville Housing Authority started looking into sensors on all their elevators. The devices would halt any movement if they detect something, like a leash, that gets caught in the doors. "We saw this could be a liability as far as a child or another animal injured in there," said operations manager J.R. Davis. "Absolutely no way anything can penetrate these areas." Meanwhile, Nancy is glad to have her friend back in her arms. "Look at him... 'I'm alive, I'm alive!'"